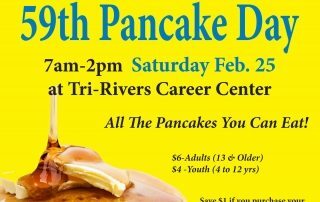 Thanks sponsors for supporting the 2017 Marion Noon Kiwanis Pancake Day, Saturday, Feb. 25, 2017 at Tri-Rivers Career Center, 7am-2pm. All the pancakes you can eat! It’s a Tradition! !